Update July 2018 – A full report, school travel plans and public engagement report outlining the results of the public engagement process are now available under the documents tab. The East Fort Garry Walk Bike Project looked at recommendations to improve the livability, safety, and walkability of the neighbourhood by identifying priorities for future improvements to the pedestrian and cycling network so that people of all ages and abilities are comfortable walking and cycling in East Fort Garry. The improvements will help create linkages within the neighbourhood, to key destinations and to current and future cycling infrastructure. The project will also help identify ways to increase the number of students, teachers, administration staff, and parents who commute to and from school using active transportation in the area. Identify priorities for improvements to the pedestrian and cycling network in East Fort Garry so that people of all ages and abilities can safely walk and bike within the East Fort Garry neighbourhood. 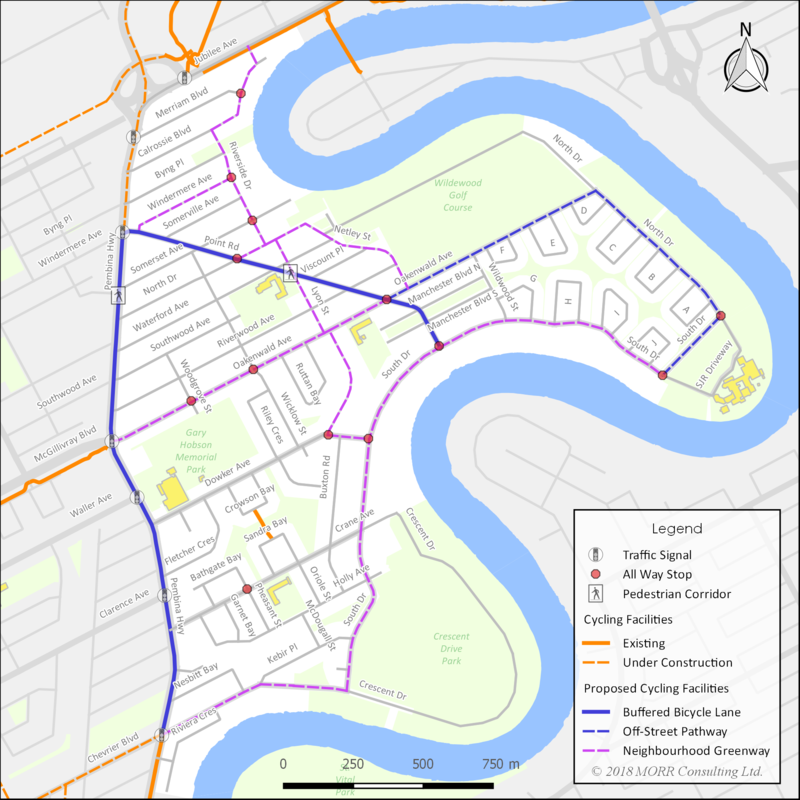 Verify and finalize the local connector bike routes and sidewalk connections proposed in the Council-approved Pedestrian and Cycling Strategies (PCS) and establish a foundation for future programming and projects. Develop School Travel Plans for four schools in the East Fort Garry neighbourhood (École Viscount Alexander, Oakenwald School, Vincent Massey Collegiate, and École Crane) and Lakewood School in the Lakewood Neighbourhood to increase the number of students and other school-related commuters choosing to travel to and from school using active modes of transportation. The strategies resulting from this study, which identify priorities for improvements to the pedestrian and cycling network in East Fort Garry, were developed based on stakeholder input collected through the various engagement methods used in the study and transportation engineering expertise. The full report is now available under the documents tab of this project page. These strategies should be considered and included where applicable within the City's planning, operations, and maintenance programs. Further, they should also be included in the update and review of Winnipeg's Pedestrian and Cycling Strategies. Intersection, roadway and sidewalk upgrades (type and location). A public engagement report and public engagement summary from phase 1 are now available under the documents tab. After receiving and analyzing public input, the project team has developed several proposed strategies for improving livability, safety and walkability in the neighbourhood. Please review the open house boards and final report under the documents tab. Thank you to everyone who joined us at an open house on March 20, 2018 at the Fort Garry Community Centre. We had 60 people sign in and collected 21 paper surveys. An online survey available on this page received 69 responses. For those who require alternate formats or interpretation in order to participate, please contact 204-944-9907 or mkrauss@htfc.mb.ca. Thank you to everyone who came out to a public workshop on October 3, 2017 at the Fort Garry Community Centre. We have over 60 participants involved in the discussion. An online survey was also available on this page until October 18, 2017 and received a total of 262 completed submissions. Check back to this site for future in-person engagement opportunities. If you would like to stay updated on City of Winnipeg public engagement events, follow the City on Facebook and Twitter or City of Winnipeg public engagement newsletter. Update June 2018 – The school travel plans have been provided to the school studied. They are now available under the documents tab. As part of this project, school travel plans will be developed for four schools in the East Fort Garry neighbourhood (École Viscount Alexander, Oakenwald School, Vincent Massey Collegiate and École Crane) and Lakewood School in the Lakewood Neighbourhood. The goal of school travel planning is to encourage walking and cycling to school, enhance school and traffic safety in the area, and improve overall options for people of all ages and abilities to walk or cycle. A variety of stakeholders will be engaged on a school walkabout in October 2017, to see the barriers in the community and to discuss potential school transportation goals and solutions. The data and feedback from the schools will be integrated into the school travel plan and the East Fort Garry Walk Bike Study, and will be considered when developing priorities for future improvements in the neighbourhood. In the spring, each school will be presented with a final travel plan to support them in their priorities and to encourage active transportation in their communities. In November 2011, City Council approved the Transportation Master Plan (TMP). A key underlying goal of the TMP is to expand the range of travel options that are available to residents, workers and visitors, and to ensure that people are not dependent on one single mode of transportation. The TMP also called for the development of the Pedestrian and Cycling Strategies. In 2013, the Wildwood Park Background Study was conducted. This study explored the history of the neighbourhood, and the importance of the preservation of the greenspaces and neighbourhood character. Identify expectations and opportunities within existing social networks for communicating and engaging with the community. Information was collected over a period of October 2014 – March 2105 through online surveys, public meetings, and telephone and email communication with individuals. Participation in the online survey totaled 61 respondents, and 42 community members attended one of two public meetings. High traffic volumes in the area and the need for a traffic study. It was determined that a second stage of engagement was needed to develop a neighbourhood pedestrian and cycling strategy for East Fort Garry. The full East Fort Garry Active Transportation Neighbourhood Scan is available under the documents tab. In 2015, City Council approved the Winnipeg Pedestrian and Cycling Strategies (PCS), which provide a long-range policy framework for active modes of transportation for the next 20 years. Active School Travel Engineering Plans were developed for École Crane and Oakenwald School in 2014, as part of a University of Manitoba Faculty of Civil Engineering course curriculum. These plans identified engineering and non-engineering countermeasures to promote walking and cycling in the vicinity of the schools. On May 18, 2016 City Council approved the 2016 Pedestrian and Cycling Action Plan that authorized the Public Service to proceed with this project. The East Fort Garry Walk Bike Project is a follow up and continuation of the East Fort Garry Active Transportation Neighbourhood Scan prepared by Green Action Centre. This project will help identify priorities for future improvements to the pedestrian and cycling network within the neighbourhood and to the citywide network. The study will be the basis for the inclusion of cycling infrastructure in immediate and future street renewal programs. How does this study differ from the 2014 East Fort Garry Active Transportation Neighbourhood Scan? This study builds upon the data collected during the Neighbourhood Scan prepared by the Green Action Centre. We will review and confirm previous recommendations with the public to ensure that they are still relevant to the current and future needs of the neighbourhood. The development of new and updated school travel plans for four (4) area schools - École Viscount Alexander; Oakenwald School; École Crane; and Vincent Massey Collegiate - will run concurrently to the East Fort Garry Walk Bike Study research, and will enrich the data collection and form part of the analysis and public input into the greater neighbourhood study. The end goal of the East Fort Garry Walk Bike Study is to develop a complete plan for future improvements to the pedestrian and cycling network in the area so that people of all ages and abilities can safely walk and bike in East Fort Garry. Are you putting in new sidewalks or bike lanes? We are studying all potential priorities and recommendations that will allow people of all ages and abilities to walk or bike through the East Fort Garry neighbourhood and beyond. When will these projects be constructed? Currently, no funding has been identified for this project; however, the first step is to complete the study which will help to identify, formalize, and prioritize future improvements. Land-use and parking varies within the study area. Parking implications will be studied and presented to the public as the project progresses. 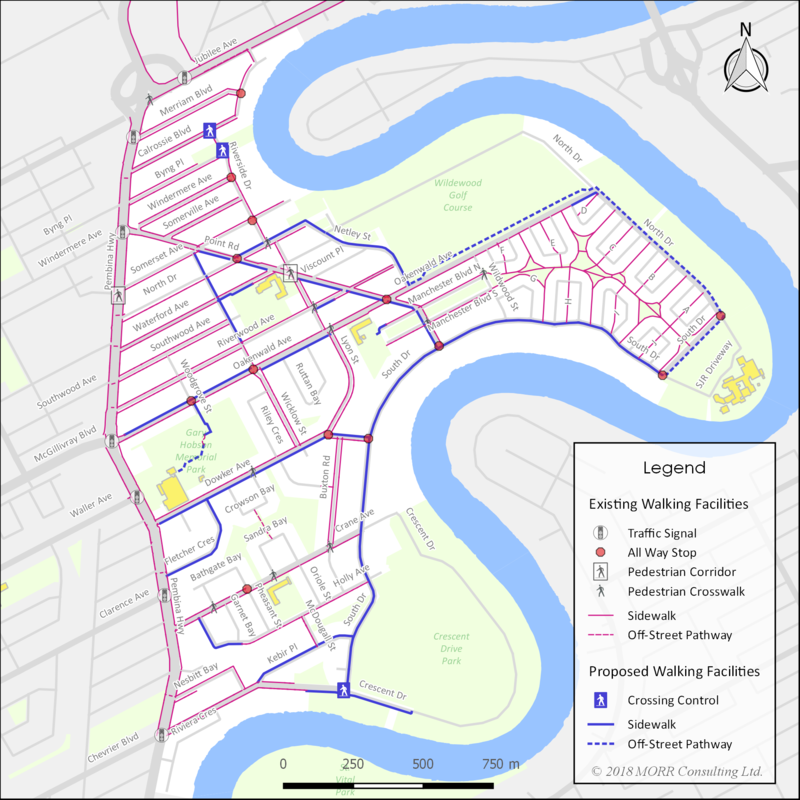 On July 15, 2015, City Council adopted the Winnipeg Pedestrian and Cycling Strategies (the Strategies). This document stems from the 2011 Transportation Master Plan. The Strategies provide a long-range policy framework for active modes of transportation in Winnipeg for the next 20 years. Following public engagement with more than 3,000 Winnipeggers in 2013, the Strategies will assist in the prioritization of walking and cycling infrastructure projects city-wide based on further in-depth engagement with neighbourhood and local stakeholders on a per project basis. How can I stay involved in the project? Contact info@htfc.mb.ca to be notified about upcoming engagement activities, look at the "Engage" tab on this website, and follow the City of Winnipeg on Facebook and Twitter .